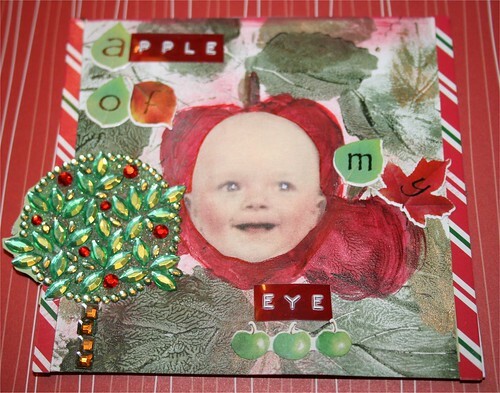 Apple of my Eye 4" x 4 Collage, originally uploaded by DianthusMoon. I was using the glaze and the stampers the other night and did apples and leaves and then had no idea what I was going to add to this. I was looking for a photo, and this sweet little baby seemed to be the right fit. I had bought the tree sticker up in Lahaska last month and added that with some paper stickers. I did add a little color to those ‘apple’ cheeks and whites to his eyes. 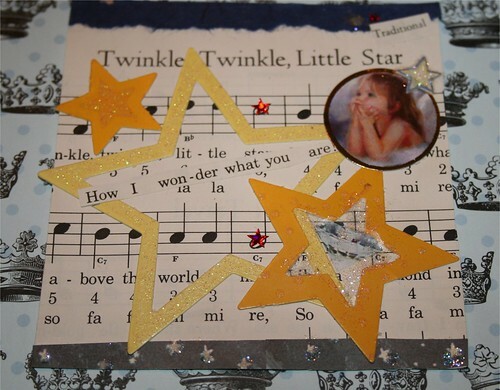 Next I picked up a kid’s music book and found the ‘Twinkle, twinkle little star’ song and went from there. It has a touch of glittler on it too. Had one of those nights when I just tossed and turned. I think I was hungry. We went to a restaurant last night in the next town and they put us near the door to the kitchen. That was one thing, but I found a piece of bone in my chicken salad club! I saw it before I bit into it. Ugh. Our microwave is on the fritz too! I can’t believe the luck we have with appliances. The dishwasher had a recall, we had to get a new washer in the summer and now this. I will have to see if a GE repairman can come out and I believe they take it to fix it. We also have continuing slow drains in the bathrooms. Mom, her friend and my brother have been busy with her house. She is getting it appraised tomorrow, so they did about 5 years worth of work in a few weeks. This is the brother who didn’t live around here for 15 years, so it was his time to do stuff for mom, though he complains about all of us not being there. He isn’t feeling well and is getting checked out this week. When it rains it pours! It seems like when one appliance goes, at least two more go within a short time. Good luck getting it fixed–I hope it is something inexpensive.